Using the beautiful Vitamin C oil from the Australian made Eco range, a wonderful anti-oxidant, known for its anti-ageing properties. 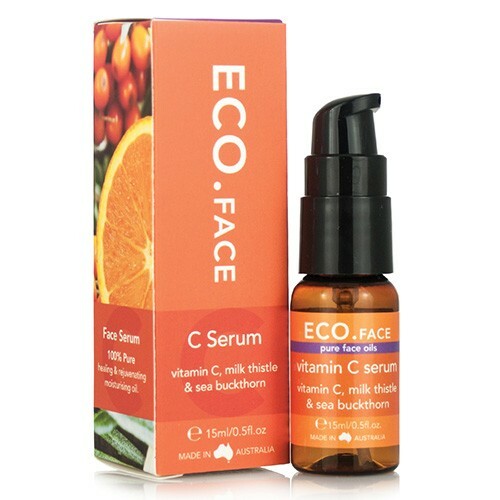 Eco Face C Serum is a nourishing blend containing Rosehip oil, Sea Buckthorn and Milk Thistle. This combination works to reduce common signs of ageing, including pigmentation, dark spots and scarring through increasing production of new, fresh skin cells giving your skin a healthy glow. As with any product that aims to reduce pigmentation and other skin damage, it is important that you apply a good quality spf to your skin daily to avoid further damage from the sun. INGREDIENTS - hydrogenated ethyhexyl olivate& hydrogenated olive oil unsaponifiables (olive) extract, camelia oleifera (camellia) seed oil, rosa canina (rosehip) seed extract, silybum marianum (milk thistle) seed oil, ascorbyl tetraisopalmitate (vitamin c), tocopherol acetate (natural vitamin E), hippophae rhamnoides fruits (sea-buckthorn) oil, rosmarinus officinalis (rosemary) oil, citrus aurantium dulcis (orange) oil, citrus reticulata (mandarin) peel oil, citrus aurantium bergamia (bergamot) fruit oil, citrus aurantium amara (bitter orange) leaf/twig oil. This Australian company produce a range of essential oils and essential oil blends that are completely natural and more affordable than many other options on the market without losing quality. They also use their oils range to infuse in to a range of personal care products. We love their natural body wash, infused with Jasmine.